The Crimean Pyramids, built before dinosaurs roamed the Earth? It appears that Ukrainian researchers have come across one of the most important discoveries in recent years as they accidentally discovered a set of megalithic constructions and pyramids in the peninsula of Crimea, well-known in ancient history for archaeological and historical treasures from different cultures and ancient civilizations ranging from the Greeks and Romans to the Genoese and Ottoman Turks. 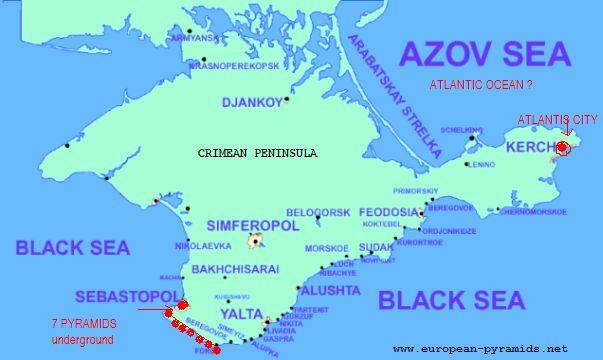 Crimea is an autonomous republic of Ukraine, it is located at the northern coast of the Black Sea. The series of formations was discovered for the first time in 1999 by Vitalij Gokh who worked for the Soviet military for over thirty years. After his long career in the Soviet military, Gokh decided to become a researcher which led him to the discovery of the Pyramids. Gokh claimed that just like there were submerged towns in the region, there were buried pyramids and other megalithic structures in the Crimean peninsula. Gokh was a former engineer thus he had very good knowledge with magnetic resonance instruments. Gokh even built a device to search for subterranean deposits of water since the area of Sevastopol had very poor water supplies. According to Gokh’s website, the devices, invented by Vitaly A. Gokh (Method of geoholography and geohydrodiagnostics) enable the detection of elements of the Mendeleev Periodic Table; oil and gas deposits, mechanisms and devices of various kinds, material objects both in the Earth and in the areas of remote Space. The devices use analogs or models in order to record structural field or the snapshots of the planets, stars, constellations, areas of Space, executed by means of satellites or telescopes. Thanks to these instruments, Gokh was able to discover several limestone blocks which had regular dimensions, ca. 2.5 by 1.5 meters and Goks and his team “assumed” these were of artificial origin. Interestingly, the instrument invented by Gokh also revealed that from the top of one of the structures, three beams of energy emanated, at frequencies 900×109 Hz, 700×109 Hz, and 500×109 Hz. Around the pyramid, a field of 10×109 Hz was found. Gokh and his team state that the surrounding layers of one of the structures reveal that the “underground pyramid” was originally above the surface in “open air” but due to flooding, the whole area sank together with the structures. According to ICTV and the Crimean News Agency; Ukrainian scientist Vitalij Gokh discovered an unknown underground ‘structure,’ which proved to be a giant pyramid of 45 meters in height and a length of about 72 meters. 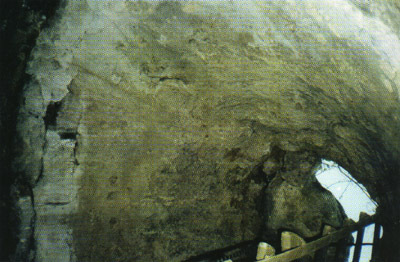 Goh said that the pyramid was built during the time of the dinosaurs. The “Crimean pyramid” has a truncated top, like a Mayan pyramid, but its appearance is more like an Egyptian one. It is hollow inside, and a mummy of an unknown creature is buried under the foundation. It is noteworthy to mention that until today the information regarding the veracity and existence of the pyramids has not been proven nor accepted by archaeologists. One of the underground tunnels in the vicinity of one of the pyramids. In an interview with ICTV, researcher Vitaliy Gokh stated that he doesn’t know who built the megalithic structures in the Crimean peninsula, but the pyramids could prove to be the oldest structures on the planet to date. So far around seven pyramids have been registered forming a straight line which from Sarych to Baia Kamyshovaia, and which runs northwest-southeast. One of these “pyramids” is located underwater in the vicinity of the city of Foros. In total, Gokh believes that there are around 39 pyramidal structures and monolithic buildings in the entire Crimean peninsula. THERE IS A MASSIVE UNDERGROUND LABYRINTH IN EGYPT.